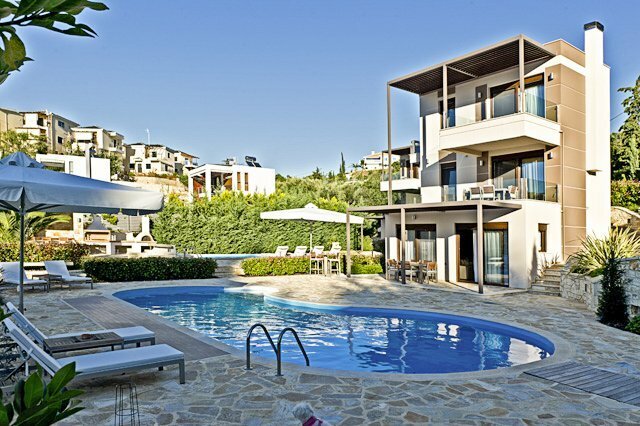 Villa Paparouna is situated in an excellent position in the beautiful town of Syvota, just a short stroll from Bella Vraka beach and all local amenities. The modern villa offers versatile accommodation which would suit couples holidaying together or families with older children in particular. It is clear that the villa has been designed with style in mind, the plush furnishings help to give it a trendy and cool feel. The two bedroom villa offers spacious and open-plan accommodation, it benefits from a well equipped kitchen with all modern appliances, lounge area with an LCD flat screen TV and air conditioning throughout. Outside, the stylish feel continues, there is plenty of seating complete with barbecue, making it the perfect location for alfresco dining. The large private pool, which is overlooked by plenty of sunloungers, is great for enjoying the views. *The bedroom configuration involves one being in a self-contained annexe on the 'lower' ground floor, while the second master bedroom is on the second (top) floor. While this may suit families with older children or teenagers, it may be more difficult for those with young children. The annexe area is part of the villa and can be accessed through interior doors but these doors can also be shut off if needed.